Vitiligo is a skin disorder that makes your skin turn white. Vitiligo is therefore considered a social disorder as well, as it is a cause of embarrassment for the patient. A person with vitiligo may tend to be socially withdrawn and could shy away from interviews, parties, or standing in front of a gathering. It is not easy to cope with vitiligo. Doctors suggest covering up these white patches with various creams or ointments to at least make them less noticeable. The white patches can be covered with certain types of makeup or other similar products. The makeup and other products used have to be free from allergic reactions. Vitiligo cover-ups are never considered to be perfect cures but are only used to keep the white patches from being too noticeable. Makeup for vitiligo is available in most cosmetic stores and because of advances, they can now approximate the color of natural skin. The chemicals used for the makeup is hypoallergenic; this means that they will not cause an allergic reaction to the user. They also would not make the condition worse. The makeup used over the white patches is called micro skin. This is because the entire layer formed by the makeup is similar to our natural skin. 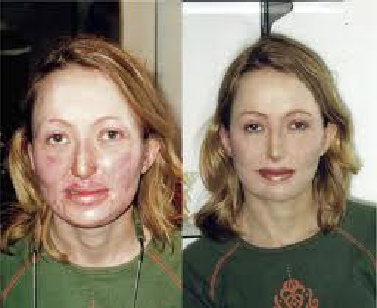 There are two ways you can apply vitiligo makeup on the affected areas. One is the stippling technique and the other is the airbrush technique. In the stippling technique for applying makeup on the affected region, you need to use a brush. This technique can be handy only if the white patches are on small areas. If the area is huge, then the makeup has to be applied using a precise airbrush that sprays the cosmetic onto the entire area and blends it well with the skin. 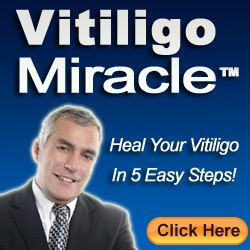 Vitiligo can be treated by repigmenting the entire area that has lost its natural color. Light therapy is another effective treatment in which the white patches are exposed to ultraviolet light rays. Dyoderm is a common skin dye that can also be used to cover up white patches caused by vitiligo. Dihydroxyacetone is the key ingredient in most of the cosmetics used as sunless tanners. This component acts on the dead cells on the skin, interacting with them to help regain their original color. This method is not a permanent cure as it just forms a tiny layer above the skin, which can be peeled off in a week. Skin dyes do not cause any alteration on the skin composition; they do not affect the production of melanin. When applying such dyes over your skin, be sure not to stay under the sunlight for about 24 hours. How can a cover-up be useful? Cover-ups are normally done to hide the vitiligo symptoms of white patches. Most of the cosmetics used on the white patches are not powdery and so are safe to be applied from home. They will not sting your eyes and are nontoxic on skin. Most of them are in a diluted form and so have to be replaced after some time. The cover-ups can be applied on any part of our body. It is easier to apply when using some sprayers. These cover-ups can also be used along with creams and other ointments for curing vitiligo.